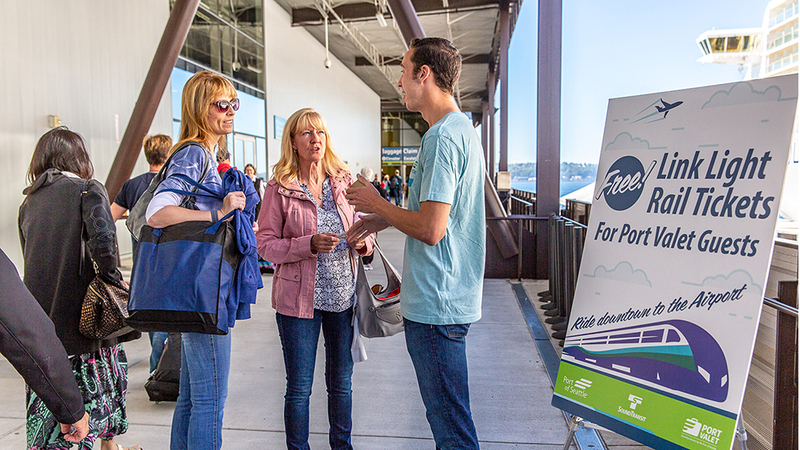 The Port of Seattle and Sound Transit, with Sound Transit mascot Zap Gridlock, partnered today (Jul13) in handing out 500 free light rail tickets to disembarking cruise passengers to encourage them to spend time in Seattle before taking Link light rail to the airport. Later this month Sound Transit and the Port will surprise 500 airport passengers with a similar in-terminal giveaway. Cruise passenger survey results show that when people spend time in Seattle, they also spend money, helping the cruise industry contribute $500 million a season to our region’s economy. Port Valet is a complimentary service that allows eligible passengers to get airline boarding passes and check their luggage all the way to their final destination while still on board their ship. Guests can then enjoy Seattle luggage-free. For the past 14 years the Port has prioritized protecting the environment while growing into a $500 million a year industry for our region. Seattle is the only homeport in North America with a voluntary clean water agreement between the Port, the cruise lines and regulators. Emissions from ocean going vessels, including cruise ships entering Puget Sound, have decreased by more than 67 percent over the last 10 years. This season is expected to be the Port of Seattle’s biggest cruise season yet, with more than one million revenue passengers, making it the largest cruise homeport on the west coast.